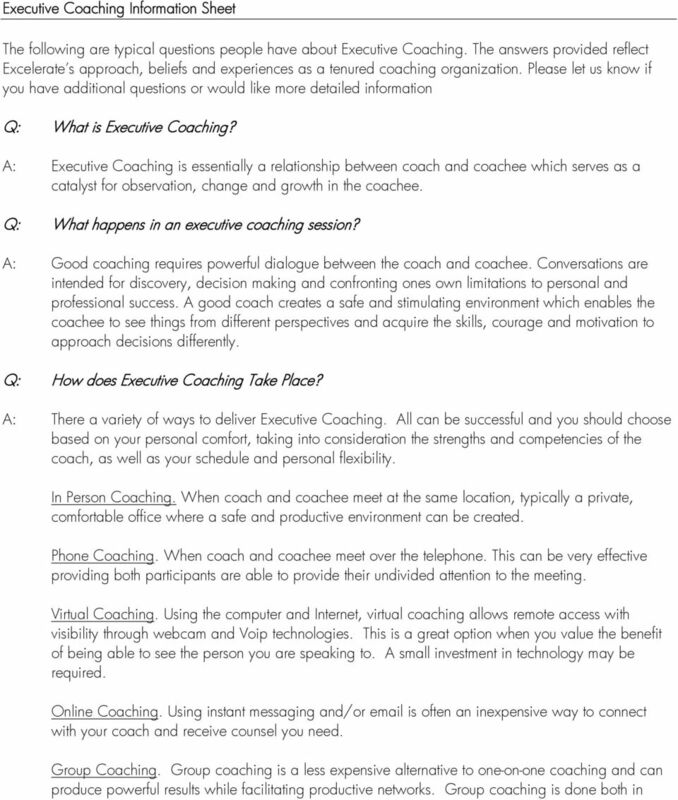 Download "Q: What is Executive Coaching? Q: What happens in an executive coaching session? Q: How does Executive Coaching Take Place?" 2 person and over the phone and typically the coach will instruct on a topic then open up the opportunity to the audience for someone to be coached in the area of discussion. Peers gain insight from the coaching experience and are provided an opportunity to ask clarifying questions as well. 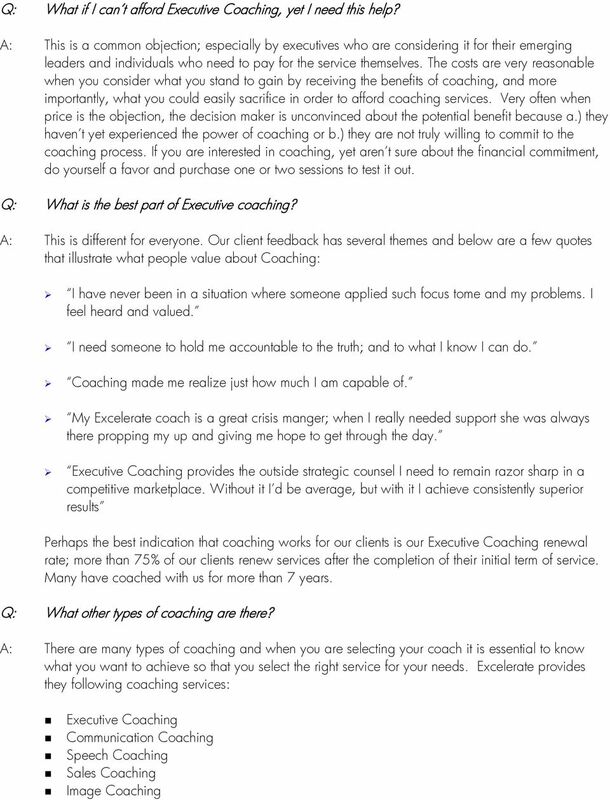 Q: What are the specific benefits of Executive Coaching? 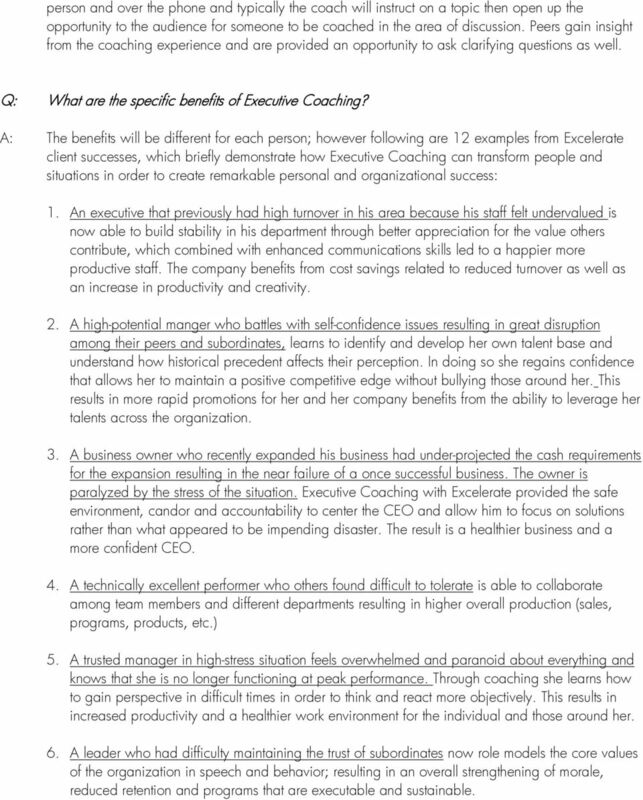 A: The benefits will be different for each person; however following are 12 examples from Excelerate client successes, which briefly demonstrate how Executive Coaching can transform people and situations in order to create remarkable personal and organizational success: 1. An executive that previously had high turnover in his area because his staff felt undervalued is now able to build stability in his department through better appreciation for the value others contribute, which combined with enhanced communications skills led to a happier more productive staff. The company benefits from cost savings related to reduced turnover as well as an increase in productivity and creativity. 2. A high-potential manger who battles with self-confidence issues resulting in great disruption among their peers and subordinates, learns to identify and develop her own talent base and understand how historical precedent affects their perception. In doing so she regains confidence that allows her to maintain a positive competitive edge without bullying those around her. This results in more rapid promotions for her and her company benefits from the ability to leverage her talents across the organization. 3. A business owner who recently expanded his business had under-projected the cash requirements for the expansion resulting in the near failure of a once successful business. The owner is paralyzed by the stress of the situation. Executive Coaching with Excelerate provided the safe environment, candor and accountability to center the CEO and allow him to focus on solutions rather than what appeared to be impending disaster. The result is a healthier business and a more confident CEO. 4. A technically excellent performer who others found difficult to tolerate is able to collaborate among team members and different departments resulting in higher overall production (sales, programs, products, etc.) 5. A trusted manager in high-stress situation feels overwhelmed and paranoid about everything and knows that she is no longer functioning at peak performance. Through coaching she learns how to gain perspective in difficult times in order to think and react more objectively. This results in increased productivity and a healthier work environment for the individual and those around her. 6. A leader who had difficulty maintaining the trust of subordinates now role models the core values of the organization in speech and behavior; resulting in an overall strengthening of morale, reduced retention and programs that are executable and sustainable. 4 and in order to create sustainable impact, coaching process generally require a minimum of six months. Most often the coaching relationship is maintained for a year or more. Q: What does it mean to achieve Sustainable Impact from Executive Coaching? A: Executive Coaching most often seeks to modify attitudes and behaviors that prove limiting to a person s success and/or contentment. Limitations are often self perceived, although sometimes others perceive it for them (and this too is a gift.) In order for coaching to be considered successful, the attitude and behaviors that were once limiting such as the way a manager completely disregards the input of his staff, or the way an executive is constantly perceived as lying to his stakeholders have to be permanently changed. Sustainable means that the behavior that was ineffective is now changed to a behavior that is effective. When the coaching stops and the improved behavior(s) remain; the impact has been sustained. 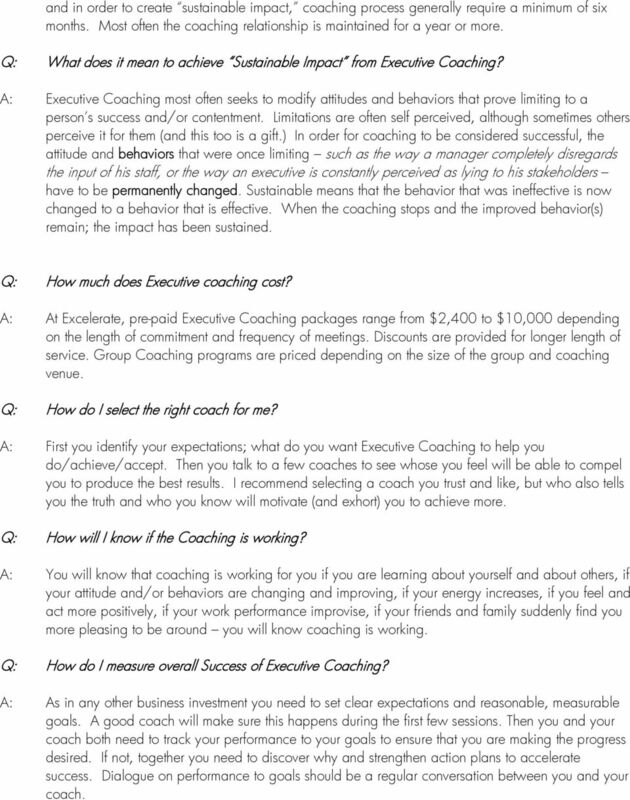 Q: How much does Executive coaching cost? A: At Excelerate, pre-paid Executive Coaching packages range from $2,400 to $10,000 depending on the length of commitment and frequency of meetings. Discounts are provided for longer length of service. Group Coaching programs are priced depending on the size of the group and coaching venue. Q: How do I select the right coach for me? A: First you identify your expectations; what do you want Executive Coaching to help you do/achieve/accept. Then you talk to a few coaches to see whose you feel will be able to compel you to produce the best results. I recommend selecting a coach you trust and like, but who also tells you the truth and who you know will motivate (and exhort) you to achieve more. Q: How will I know if the Coaching is working? A: You will know that coaching is working for you if you are learning about yourself and about others, if your attitude and/or behaviors are changing and improving, if your energy increases, if you feel and act more positively, if your work performance improvise, if your friends and family suddenly find you more pleasing to be around you will know coaching is working. Q: How do I measure overall Success of Executive Coaching? A: As in any other business investment you need to set clear expectations and reasonable, measurable goals. A good coach will make sure this happens during the first few sessions. Then you and your coach both need to track your performance to your goals to ensure that you are making the progress desired. If not, together you need to discover why and strengthen action plans to accelerate success. Dialogue on performance to goals should be a regular conversation between you and your coach. Identifying psychological traits in young lawyers Is it wise to encourage specialisation at law school? BOOK REPORT ARE YOU IN IT FOR THE LONG HAUL? Will regional talent management practices keep up with the global pace?